Rebel leaders hope to starve Colonel Gaddafi’s home town of Sirte into submission, laying siege to his last remaining stronghold in an attempt to avoid mass bloodshed, according to the man spearheading efforts for a peaceful takeover. Assisting them in the starvation of the 100,000 civilians who populated the coastal city of Sirte was NATO who rained bombs down upon the besieged city relentlessly while terrorists on the ground cut off electricity, water, gas, food, and other essential supplies. Rebel commanders have been negotiating with tribal leaders in Qaddafi’s hometown of Sirte, hoping to avoid further bloodshed. They announced Thursday that they had extended the negotiations’ deadline for another week, from this coming Saturday. “We want to save our fighters and not lose a single one in battles with Qaddafi’s forces,” said Mohammed al-Rajali, a spokesman for the rebel leadership in the eastern city of Benghazi. “In the end, we will get Sirte, even if we have to cut water and electricity” and let NATO pound it with airstrikes, he said. And despite the title of the report, the UN made no mention of the tactics of the terrorists and their NATO backers. Instead, the UN was more concerned with aiding areas of the nation already taken by NATO’s proxy army. Image: “Humanitarian aid – Qatari Red Crescent-style.” As the UN prepares to flood the Syrian conflict with another 6.5 billion dollars, tales of how “aid money” is ending up facilitating the activities of terrorists inside and along Syria’s borders suggest the UN is not trying to provide mercy for the Syrian people, but perpetuate the tragedy further still. Were it truly interested in relieving Syrians, it would expose the true genesis of the conflictto the world and hold those responsible accountable. In some areas, the terrorists have been completely surrounded, cut off from reinforcements and supplies. Just as in Libya, the Syrian Arab Army is waiting for the terrorists to be starved out rather than attempt a bloody assault – the difference being that civilians – women and children – most certainly are allowed (at least by the Syrian government) to leave the besieged areas, leaving the terrorists alone. Syrian government is accused of using hunger as a weapon of war against its people and preventing U.N. aid staff in delivering food and medicines to rebel-held suburbs. As the United Nations launched an annual appeal on Monday to help 16 million people affected Syria’s civil war, divisions among world powers that have crippled peacemaking are also denying UN staff the power to defy President Bashar al-Assad’s officials and push into neighbourhoods now under siege. “In government-controlled parts of Syria, what, where and to whom to distribute aid, and even staff recruitment, have to be negotiated and are sometimes dictated,” said Ben Parker, who ran the UN Office for the Coordination of Humanitarian Affairs (OCHA) in Syria for a year until last February. “According to the Syrian government’s official position, humanitarian agencies and supplies are allowed to go anywhere, even across any frontline,” he wrote last month in the journal Humanitarian Exchange. “But every action requires time-consuming permissions, which effectively provide multiple veto opportunities.” Fighting and rebel groups are also obstacles. The United Nations appealed for $6.5 billion on Monday to help 16 million people affected by the Syrian civil war, including millions made hungry and homeless by the conflict soon entering its fourth year. The world body estimates about a quarter of a million Syrians are living under siege as winter bites, most of them encircled by government forces, but also including 45,000 in two towns in the north that are besieged by anti-Assad rebels. A binding Security Council resolution could formally oblige the authorities to let aid agencies into areas like the Damascus suburbs and the old city of Homs, where local doctors say children are dying of malnutrition. But divisions between Western powers, backing the rebels, and Russia, have paralysed the world body over Syria since the conflict began in 2011. Once again, accusations of the Syrian government’s “crimes against humanity” are solely based on the “activists say” school of journalism, where “rebel” propagandists renowned as serial liars, have posted videos of unverified footage then reported as fact by their Western collaborators – with disclaimers later buried deep within reports. This is being done in conjunction with plans to drop the pretense of “moderate rebels,” and fully back Al Qaeda and other extremist fronts through a network of proxies including Saudi Arabia, Qatar, Turkey, and Jordan. 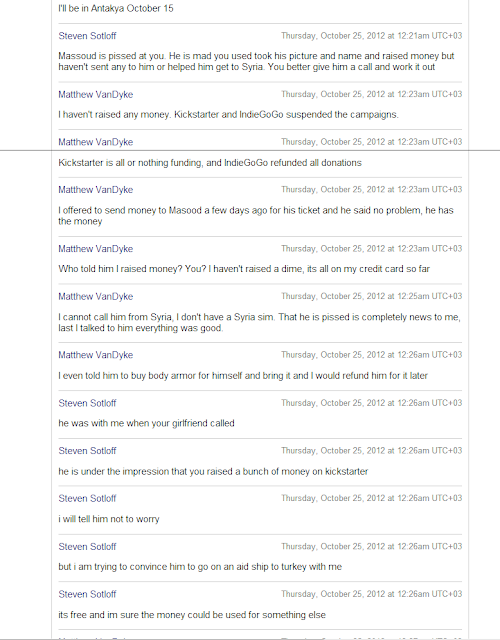 In a recent e-mail leak released by the Syrian Electronic Army (SEA), correspondences between US contractor Matthew Van Dyke and Western journalists revealed that in addition to intentionally deceiving the public regarding the nature of the conflict, aid shipments were being used to smuggle in equipment, fighters, and weapons. 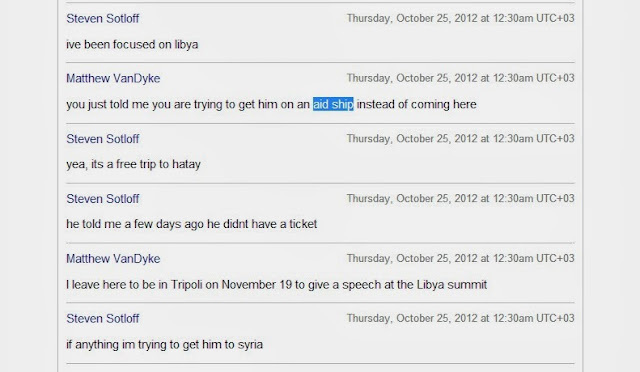 Van Dyke being an armed militant himself, along with those in his company, riding freely back and forth between Libya and Syria on aid ships should raise suspicions at the very least regarding “aid” the UN plans to provide entrapped terrorists. Sources in the investigation team said that Mahmoud confessed to receiving around $2.2 million from Khaled Diab, a Qatar Red Crescent official. He was then to hand the money over to a Lebanese cleric identified as O.O., born in 1983 and affiliated with Muslims Without Borders, in the Bekaa village of Bar Elias. 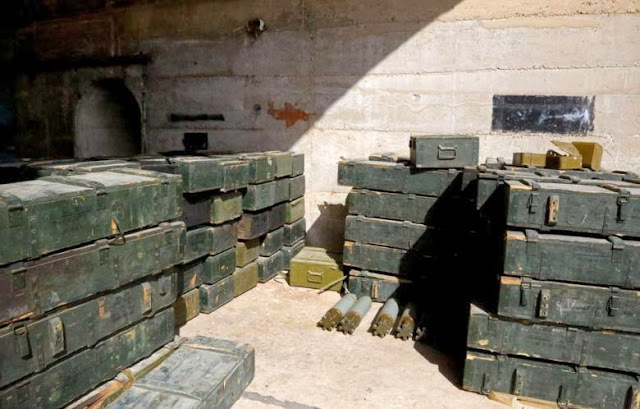 “Through the cleric, Mahmoud was able to acquire 30 RPG launchers for $900,000 and 300 shells for $300,000, which were then transferred to Syria by a smuggler known as Anwar or his nom de guerre Abu Salah.” The smuggler then handed over the weapons to the Syrian national known as Abu Abdullah in the Damascus countryside. Mahmoud also bought 100 Kalashnikovs and an ammunitions cache for $40,000 from the Ain al-Hilweh Palestinian refugee camp in southern Lebanon. The source added that Mahmoud entered the refugee camp with the Syrian national Mohammad Abdullah, known as Abu Hamza, under the guise of distributing humanitarian aid to refugees from Syria. One can only imagine what will be bought and done with the $6.5 billion the UN has called for to assist those in terrorist-held territory. It will most likely be fed directly into the terror networks the NATO and its regional allies have been preparing to expand. Should the UN decide to truly care about ending the ongoing catastrophe that is the proxy invasion of Syria by foreign-backed terrorists, it could always point out the true nature of the conflict and hold those responsible for it, NATO and its regional axis, fully accountable. Anything less is but a criminal rouse meant to intentionally perpetuate the conflict and give the West yet another chance to end it on terms they find favorable.